Health Fair Connections | What's the cost? 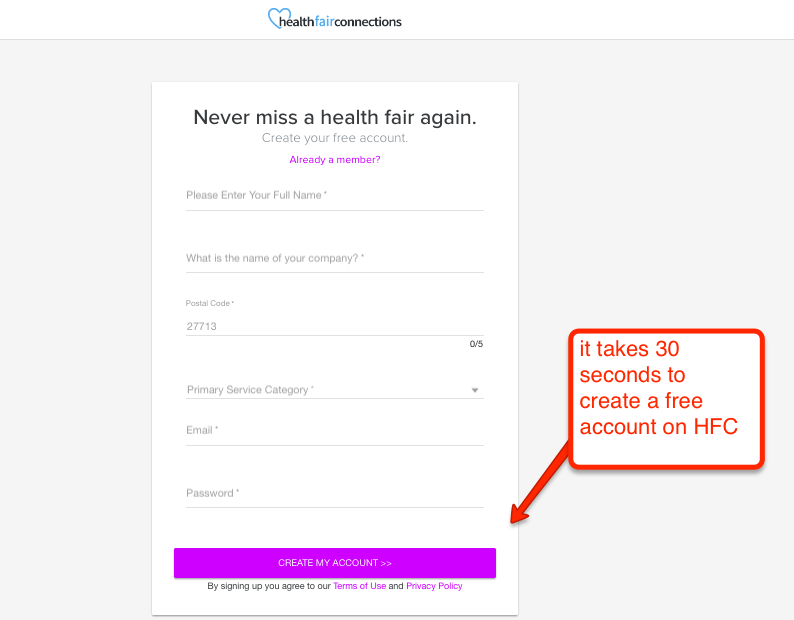 It’s completely free to create a profile on Health Fair Connections (HFC). Creating a profile is needed if you want the chance of getting into local companies who plan their health/wellness fairs through HFC's platform. You'll be surprised how easy it is to gain access. Now that you can see local health/wellness fairs on HFC, you most likely want to attend these events as well. I believe that's a safe assumption. SO, in regards to attending health/wellness fairs, there are no actual “booth fees,” as HFC does not charge for booth spaces in health fairs like other 3rd party health fair companies. The way it works is you get on the interested vendor list for a particular health fair by choosing one of two options - the low chance, free ad or high chance, paid ad options. These two options are what you would consider advertisements, helping you look good and stand out in front of the company hosting the health fair. Depending on the option you choose determines if you pay anything*. AND remember, you only pay when picking the high chance option if selected to attend, making the paid option risk-free and exhibitors favorite option. The benefits of each option are listed prior to making your selection on the event page. NOTE: This page will change on a regular basis. So believe it or not, you have the chance to participate in health fairs at no cost! We have over 1000 vendors that have never paid HFC a dime and participated in many health fairs. You have a much better chance of getting selected by the host. You’ll receive hard hitting value like being able to follow up with the host after the health fair (that's where the value is at) and more. 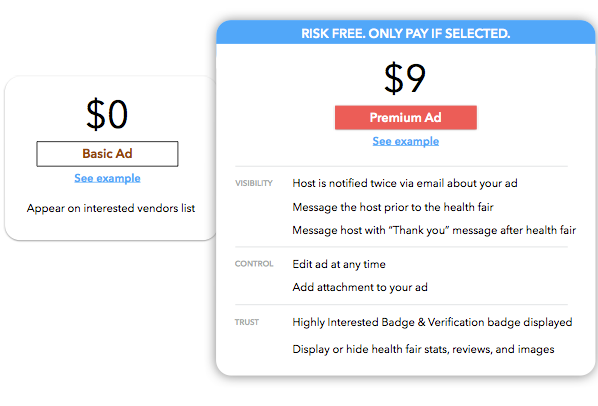 Oh, and in regards to pricing for the high chance, paid ad option, the cost varies based off each health fair (you’ll also be able to see this info on each event page as well). Thanks for reading, and hope this has been helpful.